Maybe you just bought a new game, and it’s not running as well as you’d like. Maybe you want to upgrade your gaming PC before Anthem comes out. Unfortunately, you’re on a budget, and can’t afford to drop thousands of dollars on a killer gaming rig. You don’t have to wait another year. Despite common myths, not every budget PC has to be a potato. We’ve built a sweet gaming PC for $700, and we’re going to show you how. Ryzen’s mid-range processor is nothing to sneeze at. The Ryzen 5 2400G clocks up to 3.9 GHz, and is VR-ready. The 212 Evo is a compact cooler with a fan that’s efficient, quiet, and only draws 2.64 watts. It mounts on almost any processor, so chances are you can use it with an upgraded CPU. The RX 560 does everything you want from a mid-range GPU. It has 4 GB of RAM, and it’s VR-ready for all your future needs. We went with this dual stick because it’s affordable, fast and reliable. The Viper Elite Series is only as good as your motherboard, so it’s thankful we picked a good one. The AMD X470 is another future-proof component. Whether you’re looking for lightning-fast USB 3.0 connections or compatibility with a variety of CPUs, this motherboard has it all. We chose the A55 because it provides a good balance between value and space. It’s also lightning fast, so you’ll spend less time than ever on load screens. 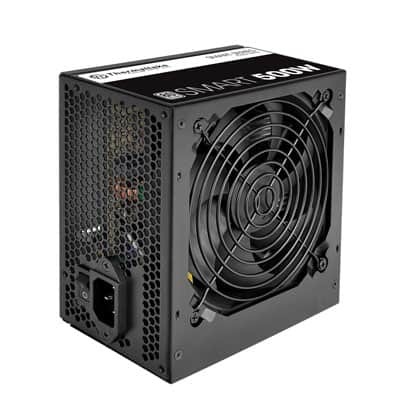 The Thermaltake Smart 500W PSU is designed specifically for the Versa H24 case. It supplies more than twice as much power as our PC needs, so you can add plenty of peripherals. A miniature case at a miniature price. It has room for 2 external drives and a second internal drive, and sports a pair of USB 3.0 ports on the front. Want to save some money and build a gaming PC for $100 less? Here’s our guide on the best budget $600 gaming PC build! Before we go over all the parts in detail, let’s look at some of the basic features of our $700 PC. Here’s what we built it to do, as well as some of its limitations. If you’re building a PC for just one kind of game, you can sometimes skimp on one feature or another. For example, fans of strategy games like Europa Universalis 4 or Civilization VI will want a PC with a fast processor and won’t be as concerned about a fast GPU. On the other hand, if you play first person shooters, you may not need as fast of a processor, but a slow GPU will make your game unplayable. Our top priority was to build a system that can run any game on the market. This meant we needed to have a well-rounded system that didn’t cut corners on any key performance metrics. In short, we wanted a system with at least 8 GB of RAM, at least a 4 GB graphics card, and at least a 3.5 GHz quad-core processor. Our $700 gaming PC has a 3.6 GHz quad-core processor, 8 GB of RAM and a 4 GB graphics card, which puts it exactly where we wanted it. That said, this computer is what it is. We didn’t get a fancy heatsink or liquid cooling because we don’t plan on overclocking anything. There are two reasons gamers tend to prefer desktop PCs over laptops. The first reason, obviously, is the price. You can get a lot more bang for your buck with even a prebuilt gaming tower, as opposed to a laptop. The second is upgradability. Yes, you can upgrade a laptop, it’s a pain. Nobody wants to do it, which is why landfills are full of old laptops. Honestly, we were surprised that we were able to squeeze as much power into this computer as we were able to. What made us even more happy was being able to use a top-notch motherboard. We’ll be going deep into the AMD X470’s feature’s in a minute, but suffice it to say this motherboard is as future-proof as they come. 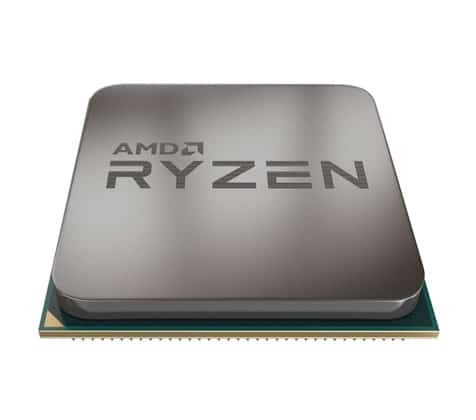 The AMD X470 can be also used with either Intel or AMD processors. This is another thing we wanted for upgradability. It’s silly to have to choose in advance, particularly since you have no idea what’s going to be the best processor 4 or 5 years from now. To keep our PC under $700, we had to cut corners somewhere. This computer doesn’t have a WiFi card, so it will have to be plugged into your router. We’ve also suggested an inexpensive WiFi card you can add onto it. Another thing we skipped was any kind of DVD or Blu-ray support. Most gamers these days use Steam or other online services to install their games, so we felt like not everyone would benefit from having a disc drive. That said, we included a review for a Blu-ray drive that will work nicely with this tower. Finally, we didn’t spring for a gigantic hard drive. Instead, we opted for a 500 GB SSD, which gives much faster load times than a traditional drive and still has enough space to store several games. If you have lots of games or a large video library, you might want a larger disc drive, so we included a review of an external hard drive that’s inexpensive and reliable. Now that we’ve taken an overall look at our system, let’s look at each of the parts. It’s time to take a deep dive into our new gaming PC. The AMD Ryzen 5 clocks at 3.6 GHz, slightly better than the 3.5 GHz benchmark for running most modern games at normal settings. Although we designed our PC with a standard cooler, this processor does come unlocked, which means you can overclock it later if you want to. It’s rated for a maximum benchmark of 3.9 GHz. 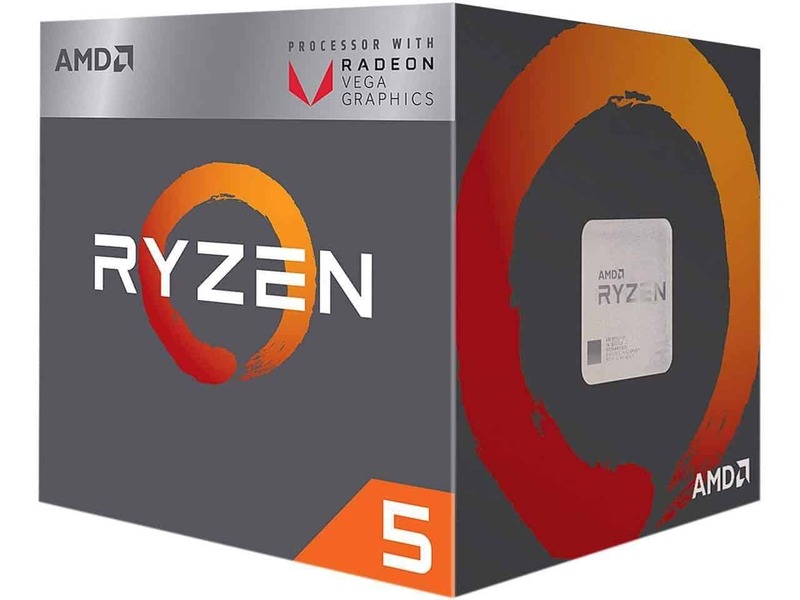 The Ryzen 5 is a step up from the Ryzen 3, which was AMD’s return to the gaming market after their FX Series fizzled out in the early 2010’s. It’s a welcome upgrade, and a sign that AMD is back in the gaming market to stay. In keeping with our effort to future proof our PC, this processor is VR ready, so it’s ready for the next generation in theory. In reality, we’d want a beefier processor if we were going to run a VR game, but this is a budget PC, and it’s nice to know the feature is there if we need it. If you’re willing to go a little over $700, you can Ryzen 7. This would have gone against the rules of our $700 PC, but it’s a beautiful processor. It has a whopping 8 cores, comes unlocked, and runs at 4.3 GHz when it’s maxed out. That said the Ryzen 7 costs more than twice as much as Ryzen 5. On the Intel side of things, the options were just awkward in our price range. There was the Core i5, which has six cores and clocks at 4 GHz, but it cost almost $50 more than the Ryzen 5 for a very marginal benefit. On the other hand, there was the Intel Core i3, which would have gotten us 3.6 GHz for almost $30 less than the Ryzen 5. Unfortunately, the i3 draws a whopping 95 watts, while the Ryzen 5 draws only 65. Besides which, both the Core i5 and the Core i3 are incompatible with our motherboard. Yes, I know I said the AMDX470 motherboard would work with Intel processors. We’ll get to that. This was a choice we agonized over. 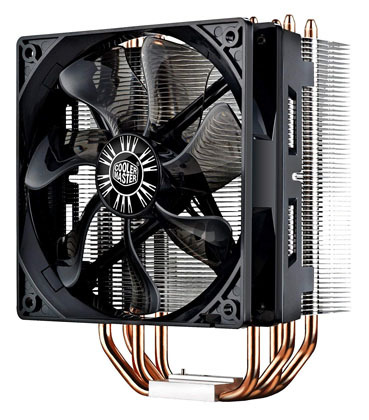 To begin with, the Cooler Master is a solid CPU cooler. It runs on a miniscule 2.64 watts of power, and the fan is whisper quiet even at maximum speed. There’s nothing wrong with this CPU sink. On the other hand, there’s nothing spectacular about it either. It doesn’t have a liquid coolant, a second fan, or a bunch of fancy LED lights. If you’re looking for a truly spectacular cooler, check out the Cooler Master V8 GTS. It moves about the same amount of air as the Hyper 212, but costs almost 3 times as much. The only real benefit is that it spreads the air out more efficiently for more even cooling, while it comes at the cost of an extra 3 inches in height, which would make it too big for our case. Here’s the thing with coolers: you don’t want to buy one of the bargain basement models, but the only point of a premium CPU cooler is to overclock your processor. We’re not here to tell you how to use your own rig, but overclocking your processor beyond its rated maximum is generally not a good idea. On the other hand, overclocking a processor right up to the maximum is just fine with any halfway-decent cooler. We’ve already touched on it, but another advantage of the Hyper 212 is its size. It’s only 4.7 inches high, so there’s plenty of clearance for it in our small case. It also meets our requirement of being easy to upgrade. It mounts on an impressive array of CPU sockets, including the Intel LGA 2066, 2011, 1366, 1156, 1155, 1151, and 1150. On the AMD side, it mounts on AM4, AM3+, AM3, AM2, FM2+, FM2 and FM1 sockets. Regardless of what CPU you ultimately upgrade to, chances are you can continue to use the Hyper 212 to cool it. For the price, the RS 560 is a beast of a GPU. 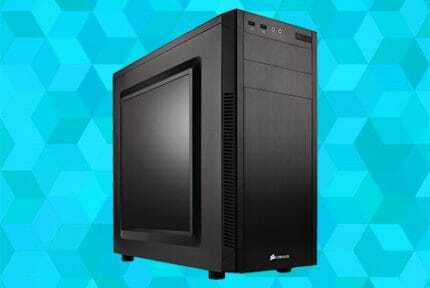 Its memory clocks at 1196 MHz, it has 4 GB of DDR5 RAM, and its solidly built. This actually costs as much as our CPU, and for good reason: we wanted to make our PC the best all-around gaming laptop it could be. The RX 560 is powerful enough to run any modern game, and should be good enough to run games at normal or lower settings for several years into the future. It’s also VR ready, which future proofs it if you decide to buy that game where you swing the laser swords around. 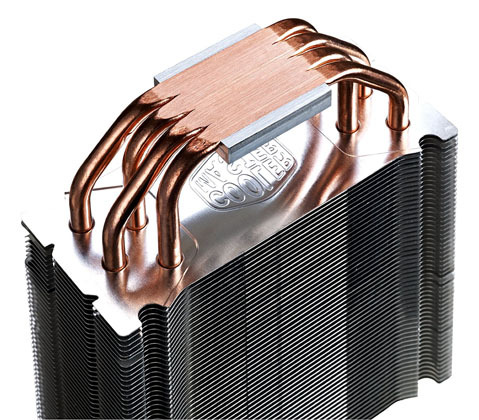 It has an integrated heatsink, with opposing fans that direct airflow through channels that surround the cooling fins. The HDMI port has an aluminum core, and you can feel the extra stability when you plug your monitor in. Your plug isn’t going anywhere, and you’re not going to damage your port by jiggling it a little. If you’re looking for something comparable with just a little more juice, take a look at the EVGA GeForce GTX 1050 Ti. This GPU also has 4 GB of RAM, but it clocks slightly faster at 1,354 MHz. It also costs about $40 more than the RX 560. If you’re a strategy gamer and your GPU is less of a concern, you may want to think about the Gigabyte Geforce GTX 1050. 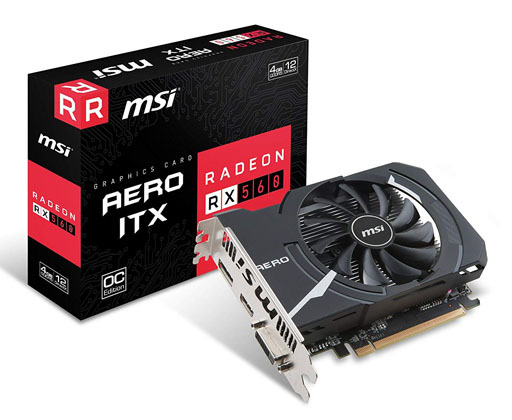 This GPU costs about $30 less than the RX60, and still supports 60 FPS video in 1080p. It only has 2 GB of video ram, but that’s not much of a concern if you’re playing Civilization. 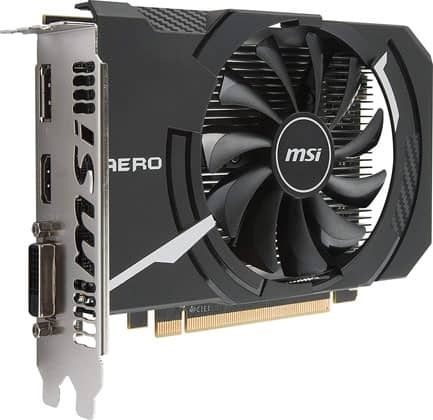 On the more high-performance side, you could consider upgrading to the MSI Gaming GeForce GTX 1060. This beast of a processor has 6 GB of DDR5 RAM, and cycles at an insane 8,192 MHz. Not only is it VR ready; it also supports 4K video at 60 FPS. Unfortunately, it costs about twice as much as the RX 560, putting it well outside of our budget. This is another controversial choice. There are a number of people who criticize the Patriot Viper Elite Series for being too slow. This is indeed the case, if you have the wrong hardware. Out of the box, the Elite Series clocks at only 2,400 MHz. Unless you change the BIOS settings or have a gaming motherboard, there it will remain, being slow. Thankfully, we chose a gaming motherboard that will automatically overclock the Elite Series to match your processor’s cycle speed, in our case 2,933 MHz. This is fortunate for us, because the Elite Series is one of the most inexpensive 8 GB DDR sticks on the market, making this two-pack a perfect choice for our $700 gaming PC. If you’re looking to save a few dollars, you can always look at a single, 16 GB stick like the Timetec Hynix IC. This is a little bit cheaper than buying two of the Elite Series sticks, but this comes at the expense of speed. It’s limited to 2,133 MHz. For about $50 more than the Elite Series, you could get the Corsair Vengeance RGB Pro. 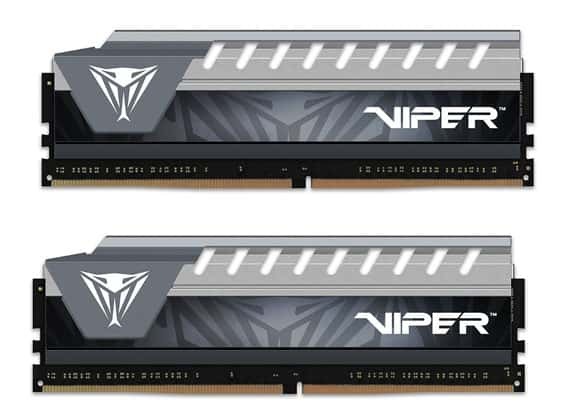 This is another 2-pack of 8 GB DDR4 sticks, but it has an impressive clock speed of 3200 MHz. If you’re one of those strategy gamers who went for a discount graphics card, this might be a good place to beef up your rig for processing those 12-way wars on Godzilla-sized maps. The motherboard is where the rubber meets the road. If your motherboard isn’t up to the latest standards, you’re not going to be able to upgrade your rig, which means you’ll end up having to start over from scratch. Nobody wants to do that. That’s why we went with a specialized gaming motherboard from MSI. It’s specifically made for current generation AMD processors, but it will also work with Intel i7 or newer processors that use the Coffee Lake protocol. See, we told you we’d get to that. In terms of RAM capacity, this motherboard is a beast. 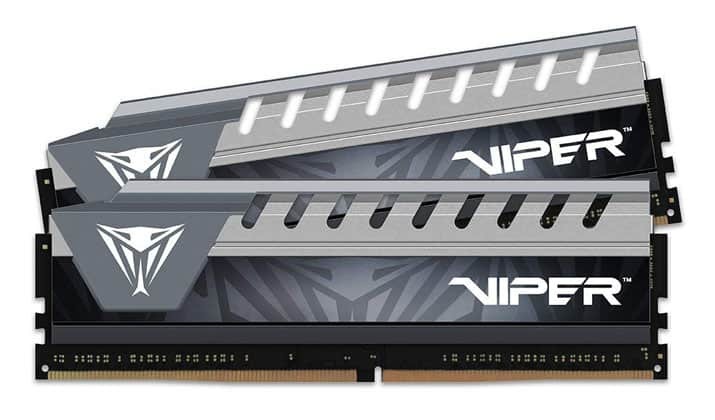 It’s upgradable to an insane 64 GB of ram if you use four 16 GB DDR4 sticks, which means you’ll have plenty of RAM when you’re playing VR games on one of Elon Musk’s Mars colonies. Oh, yes, the AMD X470 is also VR ready. It also has a dual power supply, specifically to provide extra juice to your processor. We’ve already lectured you about overclocking, but the option is there. If you’re going to go that route, you’ll need extra cooling. In these circumstances, MSI’s Smart Fan optimizations let you control all your system’s fans from one central location. You can boost your main case fan, your GPU fan and your CPU cooler fan from one central location. There are 4 USB 3.0 ports on this motherboard, as well as 2 USB 2.0 ports. The Gaming Lan Ethernet port is specially wired into the motherboard for priority processing, meaning this motherboard will deliver minimal latency for your multiplayer games. On the downside, there’s no native WiFi support, so you’ll need to use Ethernet unless you buy a WiFi card. If you want to save money on the motherboard while still getting the most out of the other parts on this PC, you can save about $30 by investing in an MSI Gaming AMD Ryzen B350. 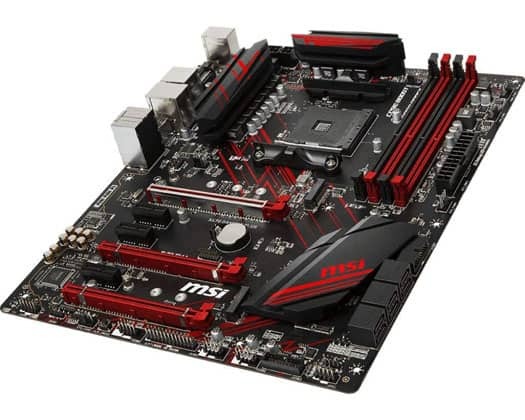 This motherboard only has 2 USB ports, and only supports CPUs with an AMD4 mount, which means you’ll have few options when it comes time to upgrade. It also has no VR support. A few years ago, we probably would have gone with an HDD drive for a $700 gaming rig. But times have changed. 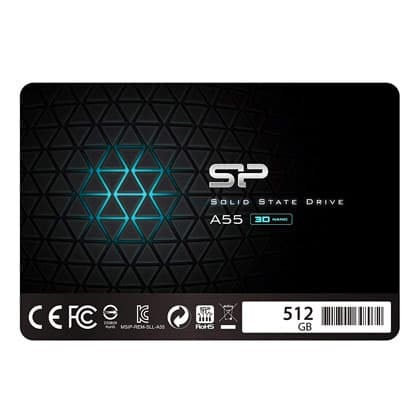 SSD drives with reasonable capacity no longer require a second mortgage. And SSDs load far faster than HDDs, making them an easy choice for gamers. 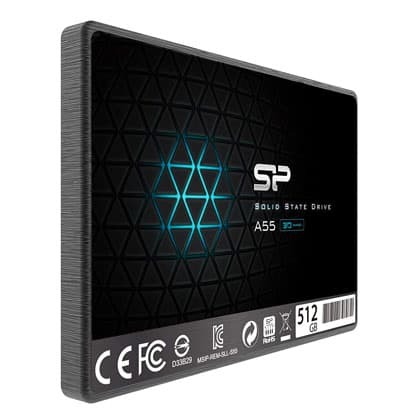 The A55 has 512 GB of capacity, and has a 3-year warranty, which makes us less worried about its long-term performance than we would be about some SSDs. It’s also very reasonably priced, comparable to some name-brand drives with far less capacity. We like the 512 GB size because it’s enough to store about two dozen games, even after installing Windows. This is plenty of space for even the most avid gamer. If you need more than that, it may be time to consider just temporarily deleting something you haven’t played in awhile. These days, the people with the most concerns about hard drive space are people with large video libraries. That’s about the only thing that can push you beyond the capacity of a normal drive these days. If you’re one of those people, we recommend just getting an external hard drive for portability, and we’ve actually included a review of a reliable one. If you need more storage but don’t want to sacrifice load time, you’re in for some expense. The Samsung 860 Evo holds 2 TB of data, which is enough space to store every season of Doctor Who and still leave room for all eight seasons of Star Trek: TNG. Be prepared to pay, though; it costs about five times as much as the A55. If load times are less of a concern, you can do really well for very little cost. 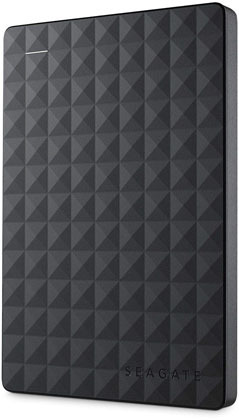 The Hitachi Ultrastar A7K2000 costs about $20 less than the A55, and also holds 2 TB of data. It has a 32 MB buffer, and runs at 7,200 RPM, which makes it as fast as some top of the line HDDs. That said, it’s still far slower than a SSD. 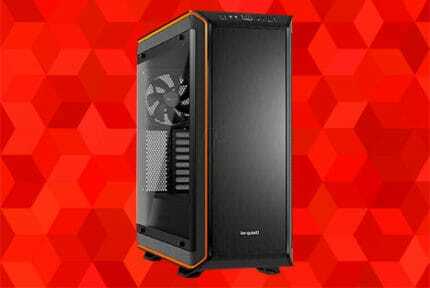 The Thermaltake Smart 500W is made specifically to work with the case we chose, and supplies plenty of power for all the parts we’ve chosen, as well as any conceivable peripherals. 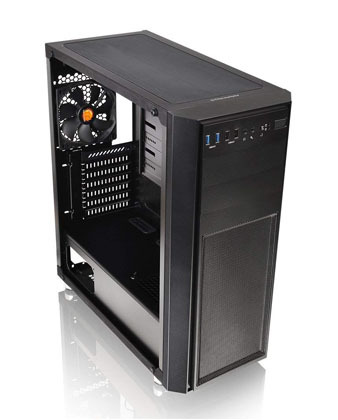 It’s very reasonably priced, and has an integrated fan in addition to the fan on the case. It provides up to 500 watts of power, and has a separate power switch for another way to shut off your machine without just yanking the plug out. It also has a vented side, which makes it easy to stick the tiny straw on the duster can through the back of the fan. For an extra $35, you can upgrade to a Thermaltake Smart Pro RGB. In addition to providing 650 watts of power, this unit has an awesome LED light that can be programmed to light up in 256 different colors. 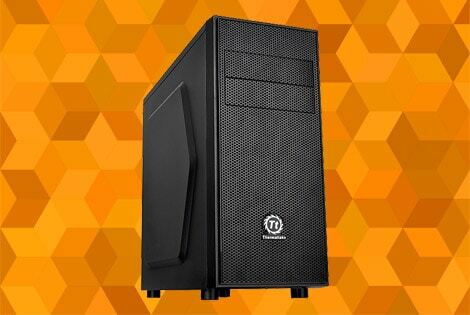 A more practical upgrade is the Thermaltake Smart Standard, which provides 750 watts for only $30 more than the Smart 500W. It doesn’t have any LED lights, but is otherwise the same as the Smart Pro RGB. With all of that being said, either of these options would have put our PC costs over $700, and they’re both overkill. Back in the day when inefficient processors drew 150 watts, it might have been reasonable to upgrade to a 750 watt power supply. Nowadays, there’s no reason for a gamer to do that. The only reason to upgrade your power supply is if you’re using a ton of peripherals, like a ProTools mixing board or other high-demand inputs. We chose to go with a compact case for a few reasons. Number one, compact cases are cheaper. Look at any leading computer case, and see if there’s a compact version. We guarantee you it cost left. Second, we chose a compact case because full-sized towers have no tangible benefit besides letting you install a giant heatsink between the CPU and the disk drives. Since we weren’t interested in overclocking our system, there was no reason to have tons of clearance there. Third, there’s no future proofing advantage to a full-sized tower. Computer hardware is only getting smaller, not larger. Nobody is out there fighting to make the largest GPU or the hard drive that takes up the most physical space. Finally, a compact case has a smaller footprint, which makes it useful for more people. The Versa H24 is a stellar case. It’s only 16.9” deep, while still being wide enough to accommodate a standard sized Blu-ray drive or HDD. It’s also very inexpensive, less than full-sized cases that have the same features. It has space for two standard-sized external disk drives, such as Blu-ray or DVD, as well as racks for two internal drives. There’s an integrated fan, which gives you enough airflow to assist all the other fans in our $700 gaming PC. 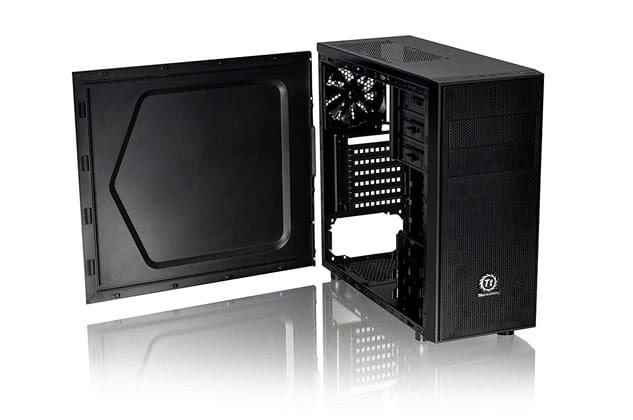 If you really want a full-sized case, it’s hard to do better than the Thermaltake View 37. Not only is this case compatible with all the other parts we’ve listed, it also has a glass side, so you can watch the innards of your homemade rig. The View 37 costs about $50 more than the H24, and includes customizable LED lights. We’ve already gone over everything you need to build a great gaming PC tower. If you’re upgrading an old PC, you may be happy with your current peripherals. But if this is your first rig, you’re going to need a mouse, keyboard and monitor to go with it. Even if this is an upgrade, you might want to think about a gaming mouse or keyboard to improve your experience. If a new tower is worth $700 to you, remember that a mouse or a keyboard costs only a fraction of that, and can often provide major benefits. Finally, you’re going to need an operating system. We’ll start with that, since it’s the easiest choice of the bunch. If you’re gaming, there’s really no better operating system than Windows. Apple is easy and convenient to use, but Apple computers are extremely difficult to build, and there just aren’t that many games for them. Windows is the leading operating system in the world for a reason: it works, and everybody uses it. Whether you’re buying your games on Steam, GoG, or on disc, you won’t find an Apple port for most modern games. If you have a lot of friends who are into PCs, someone may have suggested that you install Linux as your operating system. Linux can run most Windows games, but there’s a catch; because it needs to run them in an emulator, Linux can require up to twice as many system resources as Windows to run the same game. This is particularly true for games like shooters that use a lot of GPU resources. Linux is great for programmers and some business users. For gamers, Linux means spending thousands of dollars on a computer that runs games at normal settings. If you’re on a budget, just get Windows. That said, there’s no reason to spring for Windows Professional unless you plan on doing office work on your gaming PC. Windows Home is all you need for gaming. We do recommend the 64-bit version as opposed to the 32-bit version, though, to get the most out of your PC. We linked the USB version since it comes on a thumb drive and has a plug-and-play install. There’s a downloadable version if you have another PC to download to, and a DVD version if you decide to install a disc drive, but the USB version will work with our PC’s base hardware. 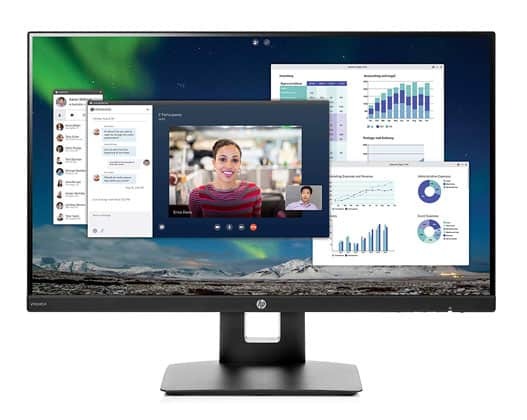 The HP 23.8-inch FHD IPS has a resolution of 1920 x 1080, just enough to qualify as true HD. This is the lowest you’ll pay for a full 1080p monitor from an established manufacturer. As a bonus, this monitor also has integrated speakers, which is one less gaming accessory you’ll need to buy if you’re on a shoestring budget. The refresh rate on this monitor is “only” 60 Hz, but let’s be honest: with the rig we’ve built the only 1080p, 75 FPS gaming we’ll be doing is during cutscenes. The LED backlight makes this monitor easy on the eyes in low light, and the 5ms response time is good enough for anyone without too much latency in their internet connection. The Acer SB220Q is a slightly cheaper monitor that’s also full HD, but it doesn’t have integrated speakers. If you’re planning on buying speakers anyway, this can save you a few bucks. On the other hand, if you’re looking to get a complete rig for the lowest possible price, stick with the HP. If you’re looking for a true gaming monitor, the Acer XFA240 is the best deal out there. Its resolution is 1920 x 1080, and it has a refresh rate of 75 Hz, comparable to some of the better monitors out there. The big improvement here is the response time – only 1ms, fast enough for even the most competitive Call of Duty matches. 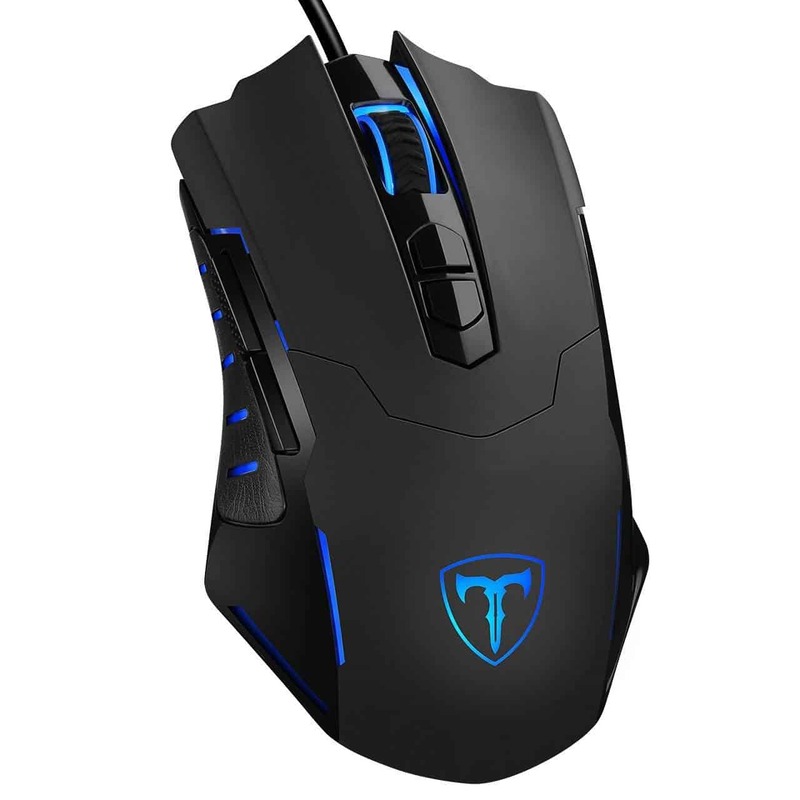 We chose the PICTEK T7 because it’s the most inexpensive mouse on the market that’s reliable and has some gaming features. It’s not the best gaming mouse out there by a long shot, but it’s the best one you’ll get at this price. This is a wired mouse, which we like, but it may irritate some people. The main mouse buttons are rated for 30 million clicks, which is more than most mice on the market. It has 4 extra buttons, two by the wheel and two by your thumb. These are preset for basic shortcut keys, but can be customized using the PICTEK software that’s included with the mouse. It can be set for various levels of sensitivity, from 1,200 DPI up to 7,200 DPI. Gamers who want a mouse with a little more sensitivity and more buttons may prefer something like the Logitech G502 Hero. This is another wired mouse, but it’s much more sensitive than the TV – up to 16,000 DPI – with a special sniper button that will instantly drop your sensitivity to 200 DPI. That said, it’s expensive, more than three times as much as the T7. If you’re looking for a budget mouse, the VicTsing Wired Mouse is a durable, basic option that has a standard, 3 button design. That said, it’s not very sensitive, only 1,200 DPI, so it’s not great for first-person shooters or high-resolution displays. Finally, the VicTsing 2.4G Wireless Mouse is a good choice for gamers who really need a wireless mouse. It’s inexpensive, but the resolution only goes up to 2,400 DPI, so it’s not as sensitive as most gaming mice. 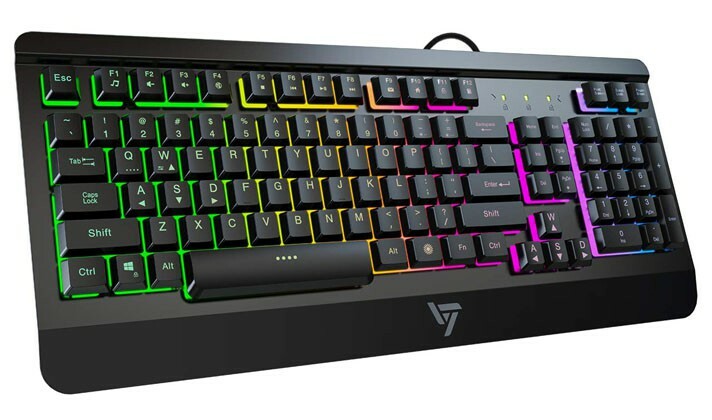 The VicTsing Gaming Keyboard is a reasonably-priced USB gaming keyboard. Yes, it has gorgeous LED lights, but that’s not why we picked it. For one thing, it’s a USB keyboard and not a battery-powered one. We understand why people prefer battery operated mice, but a keyboard? That’s one battery too many for our taste. Second is the quality of the construction. The keyboard panel itself is made of high-quality metal, and the keys are well spaced and have a light touch. There’s also a function for hot-swapping between WASD controls and the directional pad, which is great if you’re playing a game with multiple control sets. The VicTsing is also designed so that the 19 most common keys are non-conflicting. No more having your grenade button fail because you hit “E” while you were also holding “W”. Because of this and the light keystroke, this keyboard isn’t ideal if you do a lot of typing. For a more general purpose keyboard that works also works well for gaming, consider an ergonomic keyboard, like the Microsoft Natural Egronomic Keyboard. These cost about the same as a basic gaming keyboard, and while they don’t have special gaming features, they’re extremely comfortable for those long dungeon raids. If your budget is already stretched to the limit, the VicTsing Wired Keyboard is an inexpensive, no-frills keyboard that does the basics well. If you only wanted the basics, you can stop here. That’s enough to get you up and running. If you’re looking for more storage, better sound quality, or a WiFi card, we’ve listed a few compatible peripherals here that will get you pointed in the right direction. Logitech’s Z200 speakers put out a lot of punch for their size. There are two, 2.5” heads on each speaker, one active, one passive. The speakers run at a peak power of 10 watts, which is enough to fill a medium-sized room. These speakers are very reasonably priced, and don’t take up much space on your desk. They connect to your PC’s 3.5mm audio jack. 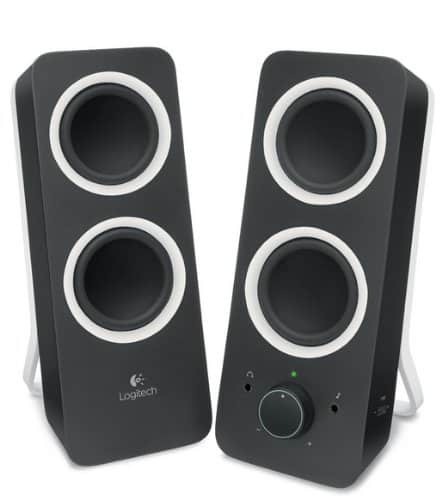 Since they’re so powerful, the Logitech Z200 speakers plug into a wall outlet, not into your USB drive. This can be a plus, since it’s one less device taking up a USB port. On the other hand, it means you’ll need to make more room on your surge protector instead. This is an inexpensive, comfortable that has all the features you’ll need. The 7-foot cable is enough to avoid accidental tugs, and the padding around the earphones is nice and thick. There’s a protective leather strap under the aluminum frame, for a perfect balance between durability and comfort. 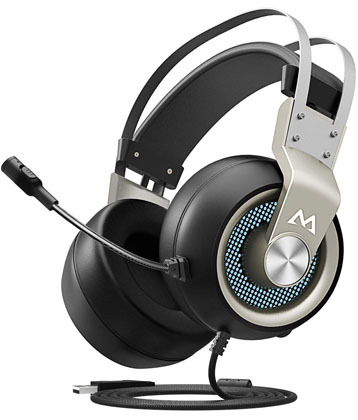 It connects via USB, and both the headphones and the microphone are plug and play on Windows, as well as on your PlayStation 4. Speaking of the microphone, it has noise filtering, so your party members won’t have to hear your dishwasher running in the background. The Mpow EG3 was made specifically first-person shooter players. The speakers simulate 7.1 surround sound, so you can hear exactly where that shot came from. We debated whether to go with an internal HDD here or an external one. In the end, it came down to convenience. Back in the bad old days of USB 1.0, external hard drives were significantly slower than internal ones. They gained a reputation among gamers for long load times and open-world games hanging between map regions. Nowadays, USB 3.0 can keep up with even the fastest external hard drives. They still load slower than SSDs, but only because HDDs are slower than SSDs in general. If you’re going to use an HDD for bulk storage, you may as well use an external one and get some portability out of the deal. This HDD holds 2 TB of data, and comes pre-formatted for Windows, so it’s as easy to use as a thumb drive. This little guy will plug right into one of the PCI-E ports on the AMD X470 motherboard. It’s dual-band, operating at both 2.4 GHz and 5 GHz, which means it will work with older and newer devices alike. 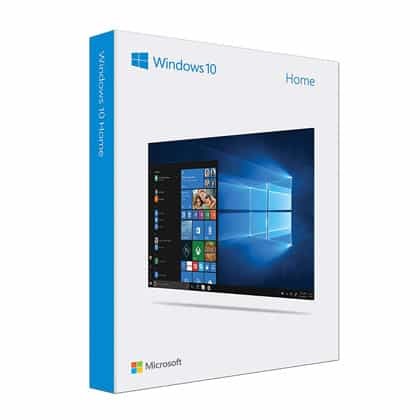 It works out of the box with Windows 10 64-bit. The speed maxes out at 450 Mbps, which isn’t going to get the most out of a gigabit connection but will be far faster than most people’s high-speed connections. 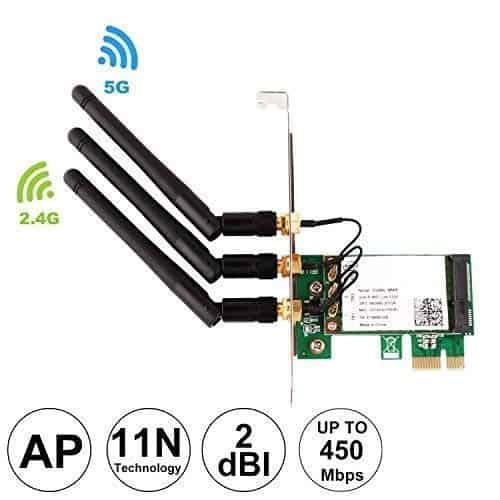 There are three optional antennas you can attach to boost your signal. You won’t need these if your computer is right next to your router, but then again, if your computer is next to your router, a wired connection will be faster anyway. This drive will mount easily in either one of the top drive bays on the Thermaltake Versa H24, and includes a SATA cable for easily connecting it to your motherboard. It’s reasonably priced, and it comes from a reliable brand. The ASUS Computer International Direct will write CDs, DVDs or Blu-ray discs, although you won’t get the full 16X write speed with the video card we used for this PC. You’d need a more powerful GPU for that, which would have pushed our PC over budget. This drive plays all CDs, DVDs and Blu-rays, including Blu-ray 3D discs. It’s also extremely quiet, even when it’s spinning at high speeds. This is great for gamers, since your disc drive won’t take off like a jet engine every time you hit a load screen. As you can see, even with a barebones system, there are a ton of accessories which can improve your experience as much as a faster processor or another 4 GB of RAM. There are a ton of ways to upgrade your gaming PC, from speakers to a gaming mouse to a bigger monitor. Whether you end up tricking out your new rig with a bunch of accessories, or whether you just want a barebones system that will run Anthem, we hope our review has pointed you in the right direction. If nothing else, we hope you’ve learned that it’s possible to build a sweet PC for $700.